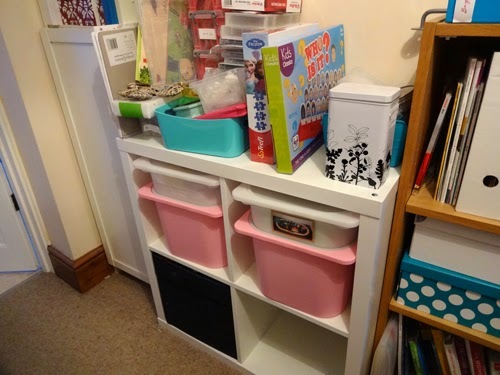 Recently I have been on a mission to try and get our house more organised. I have been moving furniture around the house to try and make things work better but it has been tricky. We live a 2 bedroom house so the girls share a bedroom. It’s not a small bedroom but not a large one so organisation as key. Well you would think but with Christmas and 2 birthdays, there is a lot of stuff in the house. Yes a lot of it is mine, but I can keep that in check to a point but when it comes to toys, it seems to take over the house. So I have decided to document my progress! I wasn’t sure whether I wanted to show the complete mess that is my home but hey ho lets go for it. I’m keeping it real! This is the girls room. Hollie has a bunk bed which I took the bottom slats out and originally had Amelia’s cot bed under but wasn’t working with Hollie throwing things into the cot that Amelia could get hold of so I moved it the other side of the room. 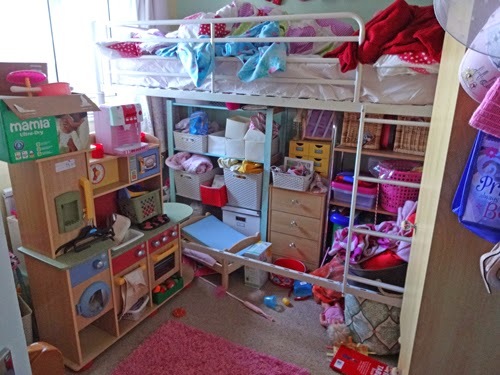 Bunk beds are a nightmare to get to the top bunk and so it looks like this! No sheet and clean bedding ready to go on but the bed needs emptying before I can change it! The is a lot of stuff including a play kitchen which needs re homing. 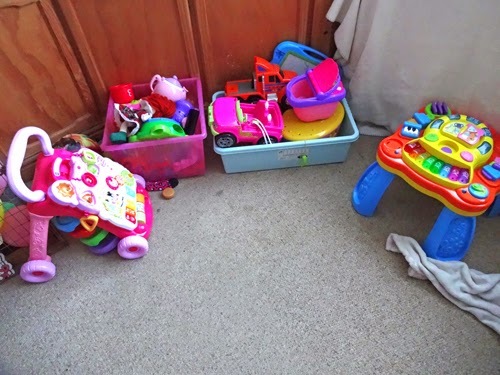 This is on the landing and has some of my craft stuff as well as more of Hollie’s toys. 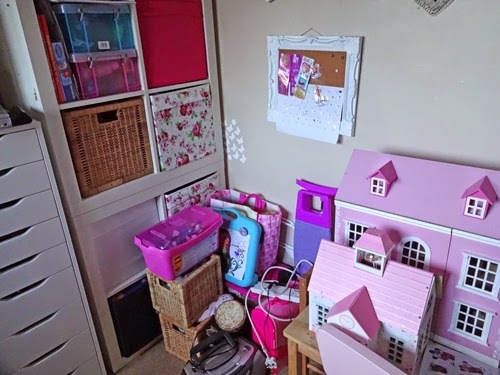 This is the other side of the dining room which is a playroom and craft space and where I wanted to keep most of the toys but that never happened. These are Amelia’s toys, well some of them. She has more in a large wooden box. Some of these are Hollies too like the truck and the barbie car but Amelia likes them so they end up in here. So I really need to go through the mass amount of toys and stuff and really sort out some organisation for it. I have no idea how long it will take me but I hope to have a clearer house at the end of it. It does give me a lot of anxiety so I thought that writing a blog post about, yes it can be embarrassing but would push me to sort it. Wish me luck! I have a feeling I may need it and if you see a pic on instagram of a large skip, you know it got the better of me! I’m definitely craving some organisation! If you have any tips or tricks for toy storage, I would love to hear them.